Let’s face it. Everything is polygonal these days. Even so called cel shaded games like Wind Waker are just cleverly depicted 3D models. I’ve got nothing against polygons, but when I see the crisp, clean lines of traditional animation show up in a modern game, it gets my attention. It is something that Behemoth has excelled at in the past, and now there is a new game that looks like it is raising the bar even further. 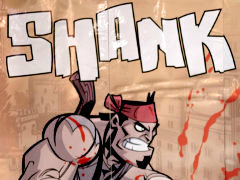 That game is Shank, and you can look for it this Summer on PSN, XBLA, and PC. You’ll have to excuse us if we didn’t exactly do an in-depth interview on this title, but after seeing the spectacular animation in the demo it was hard to take our eyes off of it. Basically, you play as a guy who looks cool doing things that are awesome. Guns, shanks, and a chainsaw all string together in hyper-violent combos that bring about glorious geysers of gorgeous gore. We are talking about diving on one unfortunate mook and filleting him with knives, then knocking back his buddy and bullet juggling him off of a cliff. Then comes the boss fight. Imagine, if you will, leaping on the back of a fifteen foot tall Antonio Banderas, then vigorously applying a chainsaw to his spine. If that doesn’t sound like a fun way to spend a few minutes, then, well… you are probably a lot more mature and well adjusted than I am. That said, the animation is smooth as silk and has the sharp, flawless look of vector graphics. I could sing the praises of the visual style for another three paragraphs, but seriously, just watch the video. It speaks for itself.